Mount Carmel School named Kindergarten teacher Zhenzhu Jin yesterday as its Teacher of the Year for 2018. Jin, more affectionately known within the MCS community as �Teacher Pearl,� was recognized with other MCS teachers and staff during the school�s 2018 Faculty and Staff Appreciation Ceremony yesterday. 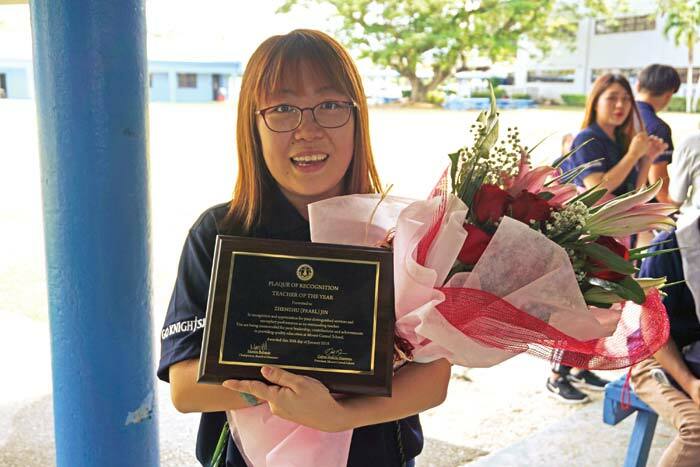 Priscilla T. Dela Cruz was also honored as the school�s 2018 Staff of the Year. According to MCS school president Galvin Deleon Guerrero, Jin won the coveted plum for many reasons. �What makes me proud of Pearl is that she was an international student that studied at Northern Marianas College. When she came here (Saipan), she struggled with English and I know this because I taught at the college and I got to know her from there,� he said. �To see her thrive as a student at NMC, graduate with an education degree, plant her roots here, work hard as a teacher and now awarded as the Teacher of the Year is such a great story. Her life and work also represents what our school is all about�students coming from different backgrounds and helping them succeed and these are exactly what Pearl has done,� he added. To be an MCS Teacher of the Year, you have to know what you are doing in terms of technique, instructional strategies, good classroom management, and, above all, to show you care for your students, Deleon Guerrero said. �Teachers go through classroom observations where we invite professionals in the community usually from NMC and [the Public School System] and they come in and conduct classroom observations. They have a scoring rubric. They follow it and whoever gets the highest score wins it,� he said. �We have a saying that we live by here at MCS. People don�t care how much you know them until they know how much you care and Pearl has shown us just that. She is usually here at 6:30 in the morning, first to get here and usually the last person to leave. She signs up for a lot of additional trainings even though she has a degree and this shows she is determined to be a lifelong learner,� he added. Jin herself was ecstatic about the award. �I wasn�t expecting this but I am very happy. I know there is still a lot of room for improvement to learn more and I am going to train harder to [improve] myself each and everyday,� she said. �I love children, especially the younger children. When I see their development and growth, that makes me very happy. This is the biggest award I have ever received in my life and, as a new teacher with not much experience, I am so thankful to everyone who gave me this chance. Everyone is so helpful, showed love and touched my heart,� she added. Deleon Guerrero said the appreciation ceremony was the school�s way of giving back to the dedicated people at MCS. �Teachers give a lot. People who enter teaching as a profession don�t do it for fame and recognition. They do it because they love what they do and the students that they serve,� he said. �It�s very easy for teachers to burn out because they are so passionate and that is why it is important for students, parents, and all of us to show them how much we appreciate what they do,� he added. This year, MCS is pushing 600 students as far as enrollment is concerned that they had to open up additional sections in the 6th and 8th grades and hire adjunct instructors. �We do our best to accommodate enrollment growth and, at the same time, a high level of instructional quality. �We have very strict rules in maintaining small class sizes so if a class is already full, we put the kids on the waiting list,� Deleon Guerrero said.